Built In Bench free plan. 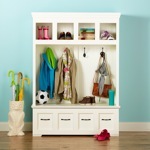 Follow along in this two part build and you should be able to customize this mudroom/entryway bench to suit your space. Free plans to build an Entryway Bench.